On Monday I received an email query via Morehouse, my publisher, saying that a customer who had bought the book had called the company to ask a question – where did I get the terminal charms pictured on the cover of the book? Wanting to reward such ingenuity (how did she find the phone number? Is it in the book?) and super excited to actually BEGIN the conversation about prayer beads and prayer I hope this blog becomes, I answered right away! And tonight I was rewarded with the nicest email note from Cathie D. on Cape Cod, Mass. – MY FIRST READER!!! So, I wanted to share the information I passed on to Cathie with everyone else – where can you get the terminal charms you see on the cover of “Bead One, Pray Too” – and where can you get other good terminal charms that are not in the shape of a cross? The charms on the cover – the tree, the labyrinth and the wooden cross – came from a variety of places. The silver tree came from Baubles and Beads, my favorite local beadstore, in Berkeley, Calif. They have another store on San Rafael, Calif., too. I’ve provided a link to their website, and if you call or email them, I found the cross at the front counter, near the register, in a little bowl of charms. 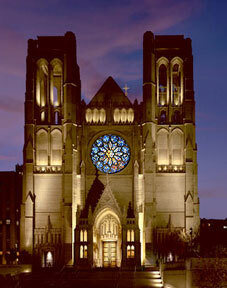 I picked up the pewter labyrinth charm on a trip toSan Franciso’s Grace Cathedral, where I found it in their gift store. Give them a call – they have LOTS of labyrinth charms and other items because they have two labyrinths. And I got the wooden cross at Michael’s, the national craft store chain. But there are TONS of places to find terminal charms that are not crosses. In many beadstores, you can find stone donuts of different sizes which can be attached to the end of a set of prayer beads with a beaded loop of flexible beading wire and a crimp bead – directions are in the book. You can also final alternative charms at many religious and spiritual bookstores and supply stores. In Oakland, we are lucky to have Sagrada, where I have bought several alternative charms. Green Girl Studios also makes terrific sterling and pewter charms. You can also use large lampwork glass beads, which artists all over the world make and sell in their local bead and craft store. Those are just some of the places to find interesting terminal charms. Anyone out there have any other ideas they can share? 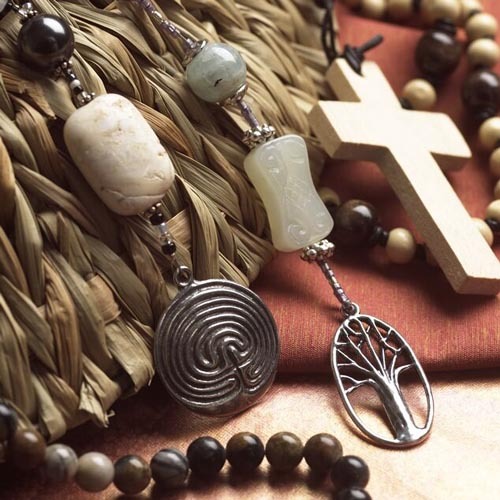 Anyone know any other good e-tailers or – better yet – local craftspeople who make and sell silver, pewter or base metal charms that can be used for prayer beads? Write in and share.